I think I'm ready to admit something. I've actually fought against it for a while, but they say acceptance is the first step. So here it goes. Hi, I'm Derek, and I'm a Chris Schwarz Fanboy. I've been a fanboy since around mid 2009 when I started exploring both hand tool woodworking and the online woodworking community. 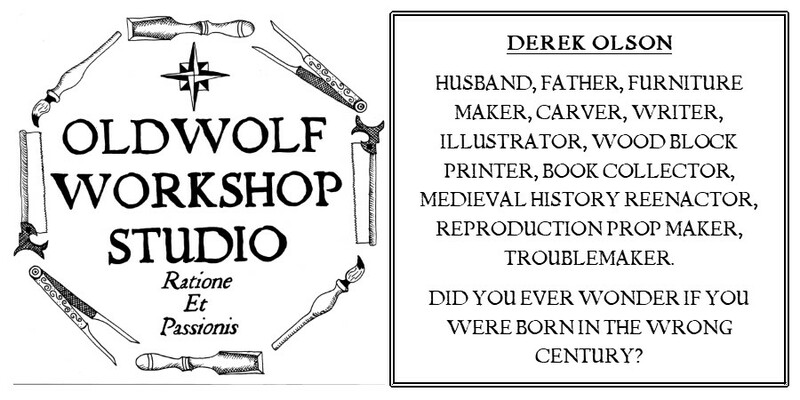 I discovered his blog and that was the end of woodworking as I knew it up to that point. I am not looking to recover, infact I refuse to consider this a problem. I have built many things he suggested, not just because he said I should, though I always try to be open to the suggestions of those I want to learn from, but mostly because those things have all inspired me. From the simple elegance of the anarchist A-frame layout square to the solid, logical reality of the Anarchist's Tool Chest. My main workbench is a hybrid of the Nicholson bench from his first workbench book and the 175 Dollar workbench (adjusted for inflation) he wrote about in the pages of Popular Woodworking. My joinery bench was inspired when he wrote about Tim Williams joinery bench on his blog, and my favorite shop accessory, the Moxon Twin Screw Vise, was also introduced to me by him. If there's something I have a passion for as much as making sawdust it's books, as a result I have built up a good collection of woodworking books and of course I've bought several of Chris's books, and works he's helped get rediscovered / republished. In his role as a publisher I am blown away by the people he's convinced to bring their own works into print with him. Peter Follansbee, Matt Bickford, George Walker, Jim Toplin and who knows who else will be next. I'm excited to find out and as long as quality material keeps flowing, I'll keep buying. Why am I writing all this? I think it's in some way an acknowledgement of where I've come from and where I'm headed on my journey. It's a recognition of someone who has inspired me like only one other woodworker has. Norm Abrams got me to start woodworking, Chris was a big part of inspiring a radical change in the ways I think and feel about this avocation. But I am for sure writing this as a way of expressing my gratitude. Hold on to this thought while I explain. 2012 has been a rough year on my family. From car issues, to health and surgery issues and all the financial weight that comes with those things. To recently being told that the management of our apartment building has decided to terminate our lease at the end of it's year, (to be the end of September) with no reasoning or explanation. We are trying to find an appropriate new home to raise our three girls in, hopefully without making them change schools again, and having less than stellar luck. I know there are people out there who face bigger challenges than we are, we haven't faced a natural disaster burning our home to the ground or washing it into the sea, we haven't faced the death of a loved one or the hardship of a spouse serving in a war half a world away. Perspective is the one sure gift that comes from working a day job as a surgical technologist in a busy hospital. No matter how bad things get for me, for us, I know that person on the OR bed, even if they are there voluntarily, is having a worse day, and I need to focus on them. But then there is the evening. The house is quiet, the kids are sleeping, and I'm laying awake, my eyes focused on the ceiling but looking into oblivion and I can feel the weight and stress leak through the walls I've built to hold it away all day long. It pushes on my shoulders like I should be Atlas, and my mind races nullifying any chance to sleep, and I feel like I'm on the edge of going crazy. My salvation is on my bedside table. It's my goldenrod bound copy of The Anarchist's Tool Chest from the first print run. It's the version before Chris had a chance to perfect it with an index and repaired typos, and I love that about it. It's spent a lot of time on my workbench, in my shop, and in my hands as I dissected it's secrets to build my own version of the tool chest. I've written notes in some of the margins, corrected typos and mistakes he admitted to once it was published, and left a few grimy thumb prints on the pages. In my opinion all marks of a treasured tome. But lately, as I battle the stress demons that haunt me at night, it's been my salvation. I turn on my reading lamp and open the pages at random. Some nights I get to read the familiar sections on tool choices, (last night I worked my way through the rules for workbenches) Some nights I get to read through an area detailing the chest construction, and some nights I pull open the book all the way into the back and read through what I've started calling the philosophy and call to war section. After a random period of time has passed the familiar words start to blur and I start to yawn. I've managed to pack away the stress and my mind is now filled with sugar plum sawdust fairies and Stanley No. 5 candy canes and I drift off to sleep planing the next time I set foot in my shop instead of planning the untimely deaths of the lowly bean counters of the world. Because I'm me, I've tried to decipher why the book has become so important to me, especially lately. On one hand I think it's because it's familiar and I know it well. My mind doesn't have to work to process it after I'm reading a passage for the umpteenth time, it can just relax and take it in. I have Matthew Bickford's new molding plane book and I found I just had to put it down for now. It's well written and the information is incredible, but I just don't have the neural capacity to assimilate the information right now. I might as well be reading the instructions to set the time on my alarm clock. I will have to circle around back to it, especially after I get my hands on a few hollows and rounds. The biggest reason I believe I'm finding comfort in the book is the theme. There is a flavor of independence and self reliance that hints on every word Chris typed. But it's not just independence for yourself, it's utilizing your independence to help support and promote the independence of others. It's in the introduction, it's in every passage about choosing a tool to last a lifetime, it's in the theory of the chest build, and its in the construction details. Those things, those ideals of self reliance and independence are so very important to me, especially at this moment in time when they feel so very out of reach. The Anarchist's Tool Chest makes me want to take this moment when I'm on the brink of giving in and instead create a mile marker for turning this ship around and righting the course. And even if you take away the esoteric, the words still remind me that tomorrow, despite everything else, I can still step into the shop and make some plane shavings, and that's something bean counters can't take away from me. Quite a while ago I managed to catch a comment by Chris on this blog. In a fit a goofiness I slapped a Lost Art Press temporary tattoo on my forehead and posted some pictures of it. Since then I don't know if he ever passes by here on his way around the internet so I don't know if he'll ever get my message gratitude. Hell, at this exact moment I'm not sure if I'll have the cojones to hit the publish button on this post because it's a bit below the skin. I hope someday, maybe a few years from now, I'll have the chance to take a class with Chris and meet him face to face so I can thank him in person for writing a book I've found so helpful for so many different reasons. Again, just in case, Thank you Sir! P.S. in case you have found yourself trapped in an abandoned mine shaft or trauma induced coma for the last few years and you don't know Chris, his words, and most of his work can be found over at Lost Art Press. If you don't own The Anarchist Tool Chest, what the hell are you waiting for, get over there and buy it. I've never made that strong of a recommendation of anything in my life before, but I guess I am now. Derek, an excellent and very personal post. I think all of us can relate to the "demons that haunt us". I wish you and your family the best fortune. I too, also have drunk the Kool-Aid. I have been fortunate enough to attend two classes he instructed, and it has completely transformed what I do in the shop. 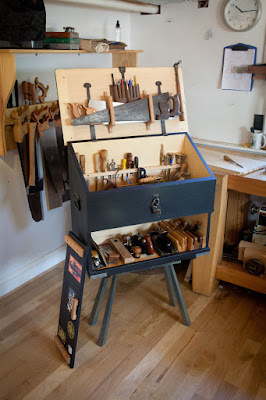 This is an incredibly well-written post that speaks for many of us, and I'll proudly show anyone who wants photos of my tool chest, layout square, Roubo bench, and others that prove hand-tools make sense. I'm a fanboy too :0) And if being wrong feels this right... y'know. I've been lucky enough to meet him twice, once for a class. He's a good teacher, I certainly walked away feeling much more confident about using the planes that I've acquired. Good luck with the housing hunt. I too am dealing with something similar, and it's always stressful. Finding the right place takes a lot of effort and patience, but we don't always have that luxury when someone else is imposing their schedule on our process. I feel for ya. I am truly sorry about your stressful year and especially this new hassle. Thank you for trusting us enough to share some hurt. I too am a Chris fan. I really find it interesting that most all of the fora have at least one Chris basher. I find that very puzzling. I know a couple of the old tool guys think he is a heathen because he uses power tools. I had the chance to meet him and he really seems to be a nice guy. His sense of humor is refreshing. His attitude is " here is the way I do it and why. If you have another way that works for you go for it". Who can fight with that.? His shows with St. Roy are priceless. Excellent post, Derek. And something many of us can relate to—reaching for the sanctuary of our books when life gets too stressful. I feel the same way about Anarchist's Tool Chest. Add me to the mix. Shwarz tipped me over to the hand tool edge. Then I realized I actually liked The WoodWrights shop (use to hate it when my dad watched when I was a kid). Now I'm considering no power in my budding shop at all. Sorry for your tough year.